My hometown of Port Elizabeth has many great characteristics. It has great people who are friendly and welcoming. It has miles of pristine beaches. It has all the amenities of a big city while still being a comfortably manageable size. But what it doesn’t have is four noticeable seasons. And if you are wondering where I got the adorable bamboo leaf plate and bowl, they were both kindly sent to me as free samples by Restaurantware, who make a beautiful range of bamboo biodegradable disposable cutlery and crockery for catering professionals. This soup is low on effort but high on flavour - perfect for chilly Autumn evening! Chop the pumpkin into 6 or 8 wedges. Scoop out the seeds and place the wedges skin side down on a baking sheet lined with aluminium foil. Brush them with a little olive oil and place a dab of butter in the hollow of each wedge. Sprinkle liberally with a mix of the cumin and the coriander. Roast in the over for about an hour or until soft enough to be skewered with a fork. In the meantime, heat a little olive oil in a large pot and gently fry the onions until translucent but not brown. Scoop the flesh out of the pumpkin skin and add to the onion in the pot. Mash with a fork. Add the coconut milk and Thai curry paste and stir until it starts to bubble. Using either a masher or a hand blender, mash to make a smooth puree. Add the chicken stock in increments of about 150ml, stirring well after each addition, until the desired thickness of soup is obtained. Serve hot, topped with a sprinkling of chilli flakes. I love the idea of pumpkin with the green curry. 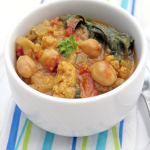 This soup is going on my try-it list! Interesting Thai twist. I love it! Your pictures are lovely Jeanne! I love Butternut Soup so I am sure that this one will tickle my fancy as well. Love the leaves you have used as props here Jeanne ;o)! I love thai curry paste and this soup has such wonderful soothing and warming highlights. delicious! I’m glad the pumpkin made a decision about its future – sounds like an excellent choice. I’ve got one that’s decided to become a tagine when it grows up, so that’s tonight’she dinner taken care of. I love the pumpkin and coconut combination that you went with – so smooth and sweet and just quite delicious! And thanks again for your “photography 101” lesson. It really was useful, and a great afternoon of food and chatter. I’m starting to think more before I take photos, instead of just pointing and hoping for the best. Thanks also to Nick for putting up with us! Lovely autumnal colours and flavour in your gorgeous pics, Jeanne! We do get a bit more of spring and autumn than PE but I still feel shortchanged on the autumn leaves and the daffs, so it’s nice to get a glimpse of them from you. Today it is really spring-like with blustery showers and a chilly wind – Surely November is supposed to be summer here! Have just ordered my first DSLR so a getting to know your camera session sounds very appealing. Shame I’m not on the same continent! Love the bamboo stuff and the recipes of course, and you make me miss England. Haven’t seen an Autumn in over 16 years…boo hoo. Nice recipe! I love this soup. I just did a very similar one here: http://delishhh.com/?p=2445 and everyone loved it! 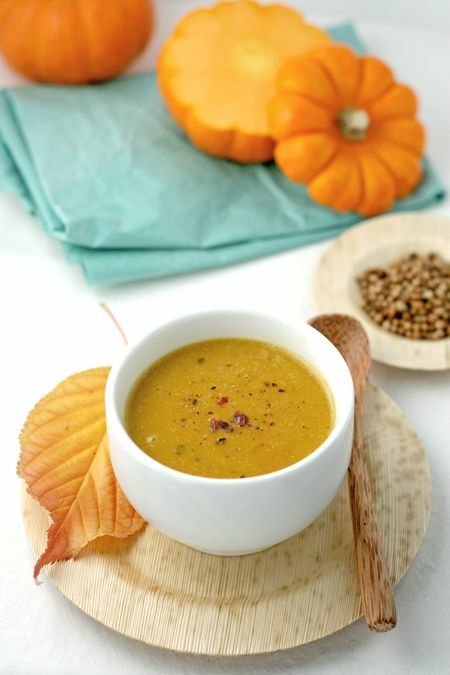 Mmm now a Thai twist on pumpkin soup sounds absolutely wonderful. I will have to buy another pumpkin! Wonderful pictures with the leaves too. Love the Thai flavors here. I have done the squash soup with coconut milk but never used the real curry paste. So perfect. The soul orange leaf is beautiful! Your photos are amazing. You should submit this post to dishfolio.com! i tried the 101cookbook’s version and it’s very breathtaking. and i won’t hesitate to try your version. but is there a big difference between pumpkin and squash? aside from pumpkin being a little bigger. Just made this, with butternut, to huge acclaim from my family. Jeanne, Cooksister is turning out to be my go-to website when my recipe books hold no inspiration. Your recipe index is superb. What I want to know is where is your recipe book and for that matter, BBC, where is Jeanne’s cookery show?! You must be made of sterner stuff than I, Jeanne. I find London’s (very) late spring and (very) early fall to be delightful but am too much the hothouse flower for the winters you have there. I love the way you’ve incorporated coconut milk and spices to add some tropical warmth to this seasonal fall soup. 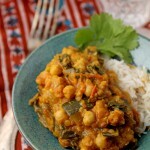 This recipe is simply stunning and a must-try for me. Just had this for breakfast. Just wanted to let you know that I made this soup for a fundraiser our swim team was putting on this weekend, and it was such a hit they begged me to make it for today as well. People were coming back asking for more. 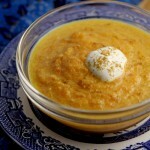 One person didn’t even like pumpkin but loved the soup. For reference I used canned pumpkin 4 large cans (29oz. each) and doubled everything else in the recipe. The perfect fall soup! I love the Restaurantware bowl and spoon. And I love the soup. I love the Thai flavors you have added. What a huge spicy difference from the pumpkin soup I usually make. And Port Elizabeth may be very like season-wise where I grew up. 9 months of blazing hot summer with 3 beautiful, cool winter months. So of course I go nuts for Autumn! And Autumn food. Like this. Could I substitute the real pumpkin for a can of Pumpkin? Sounds yummy but those little pumpkins look too cute to be eaten! Absolutely loved this Thai Pumpkin soup. Made it today on a cold & sunny Autumn afternoon on the Western Cape! Such an easy recipe & so delicious. I also loved your write up before the recipe about the seasons in Africa compared to London. I love both continents but South Africa wins in the end!